Veterans Day celebration at Cullen Park 2012 | Cullen Park & "Visions of Cullen Park"
The plan was for the flag raising and dedication ceremony to start at 2pm Sunday. A few of us went there early to set up and get ready for people to arrive at the 2 o’clock start, but by 1:30, the Veterans and friends started trickling in, by 1:45 they were parking on the grass! It was just over whelming and beyond our expectations as to the number of Veterans that attended, estimated at around 100. We had all 5 of the branches of service represented. 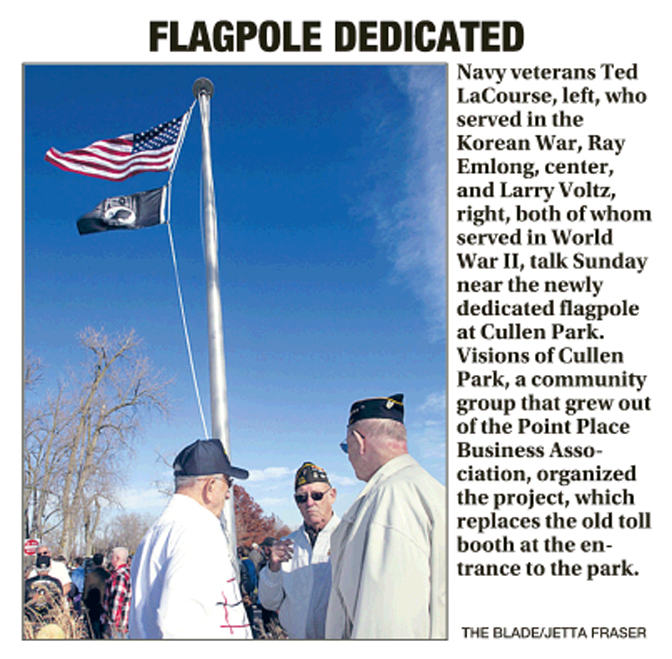 The flag raising ceremony at Cullen Park was the continuation of the Veterans Day celebration, that Howard Pinkley had annually hosted in front of his flag shop on Summit St., with Howard’s passing in September. The dedication part of this ceremony, was to dedicate the newly completed Cullen Park “Entrance Way” project that we took on a month ago. We worked with the City of Toledo Parks Division, to remove the no longer needed toll booth on august 31st., then beginning October 25th and complete on November 1st with the installation of the flag pole, all by Volunteers and donations. Below is a YouTube video, shot by Eric Wildstein, of WNWO channel 24 of Toledo, Ohio. Thank You Eric for documenting this historic and moving moment in time for everyone especially the community of Point Place to cherish for ever!